Rosario is a city in the Santa Fe province of Argentina. It's the third largest city in the country and has more than one million residents. It's also the liberal hub of the country and there is an eclectic and dynamic population. There are many street performers and artists in the city and there is an active nightlife scene. 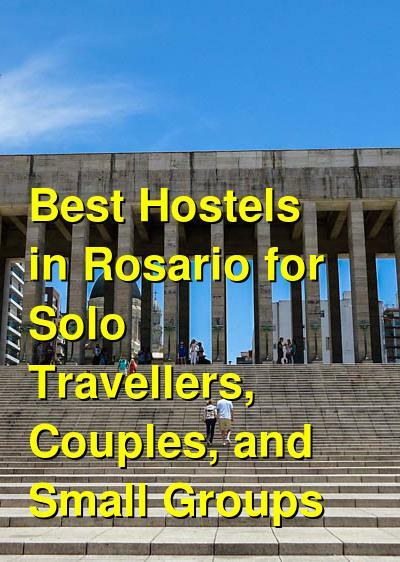 Rosario has several types of hostels. There are hostels that are more geared toward partying and there are hostels that offer a more relaxing and quiet environment. You should consider your priorities before you book accommodation. How much do hostels in Rosario cost? A good hostel for solo travellers and small groups. Art Rosario Hostel is located in an old house in the city center of Rosario. The house is charming and fully renovated to provide everything that a traveler might want or need. It's close to the river and the National Flag Monument, where the Argentinean flag was raised for the first time. It's also close to many museums, parks, monuments, and lakes. The hostel includes all kinds of amenities for guests such as complimentary breakfast, security lockers, a full shared kitchen, a living room, cable television, free internet access, wi-fi throughout, and a barbecue. The hostel is a friendly and fun place to stay with a young staff who enjoy getting to the know the guests. They know the city well and can offer all kinds of suggestions for your time in Rosario. There are both private rooms and dorms available. Private rooms include singles, three bed, and four bed rooms. Dorms sleep six, eight, or nine people. A good hostel for solo travellers, couples, and small groups. Bon Voyage Hostel Boutique is a small but welcoming hostel that is convenient and affordable for backpackers and budget travelers. It's located near several bus lines and is a clean and comfortable option in Rosario. The hostel has all kinds of amenities available for guests including meals you can purchase, excursions you can book, and city tours. There are also salsa lessons, tango lessons, yoga classes, and various workshops that you can join. The hostel has double private rooms available as well as four bed co-ed dorms. The staff pays attention to the details and the rooms are kept very clean. If you're looking for affordability and comfort, then this is a good option. Kundera Hostel is another good option in Rosario. It has a bit of the atmosphere of a hotel, but it's conveniently located just a short walk from the main Avenue and the city's main monuments. The hostel has a relaxing and respectful vibe and it is kept clean and comfortable by the staff. This is a good value for budget travelers who are looking for simple but comfortable. The prices are reasonable and the rooms are decent. Most dorms sleep up to six people, and there are also several rooms that sleep up to eight people. Male only, female only, and co-ed rooms are all available. La Lechuza Hostel is one of the most popular hostels in Rosario. It's a relaxing and comfortable place to stay and the owners are travelers themselves so they work hard to keep the environment fun and welcoming. They offer everything that you could want and need in a hostel. La Lechuza is located right in the city center and is near the best nightlife area. It's about two blocks from the pedestrian Cordoba commercial hub of the city and is walking distance to the waterfront. 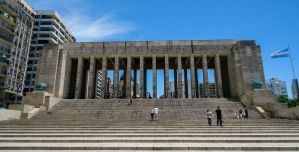 Nearby you'll also find the birthplace of Che Guevara, the National Monument of the Flag, the Macro Museum of Contemporary Art, and several parks by the river. The hostel is located in an old house and the rooms have high ceilings and a good amount of space. There's a large veranda, a bar, and a shared kitchen where guests can prepare their own meals. The hostel is also close to a supermarket so it is easy to pick up groceries and prepare your own meals. Also nearby are banks, libraries, and travel agencies. Throughout the hostel there is wi-fi. La Lechuza is a fun and social place to stay in Rosario. It is also affordable and has both private rooms and dorms available. Private rooms include twins and doubles while dorms sleep four, six, eight, or ten people.